The U360-004R USB 3.0 Hub allows you to add 4 superspeed USB 3.0 ports to your desktop or laptop computer. USB 3.0 supports data transfer rates up to 5GB per second - 10x faster than USB 2.0. It's also backwards compatible so you can connect USB 3.0, 2.0, and 1.1 devices including smartphones, tablets, external drives, digital cameras, camcorders, MP3 players, printers, scanners, keyboards, mice, webcams, game pads, memory card readers, and flash drives. Set up is plug and play. 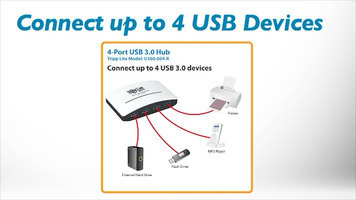 Simply connect the hub to an available USB 3.0 port on your computer and connect your devices to the hub. If you need an easy way to add extra USB 3.0 ports to your computer order Tripp Lite's U360-004R. If you need an easy way to add extra USB 3.0 ports to your computer order Tripp Lite's U360-004R. Tripp-Lite's U360-004 R provides an easy way to add extra USB 3.0 ports to your computer. 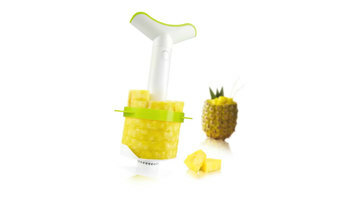 Slicing pineapple has never been easier with this Vacu Vin pineapple slicer! With versatile cutting options, you’ll have visually appealing, perfectly sliced pineapple every time. 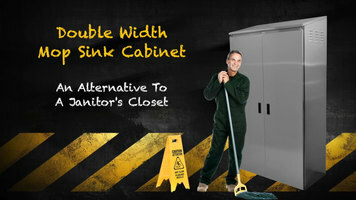 Learn about the features and benefits of using an Advance Tabco Double Width Mop Sink Cabinet!